Marine debris is not a new topic, however the degree and rate at which our precious marine environment is being harmed by ever-increasing amounts of marine debris is an issue worth highlighting. Did you know the Great Pacific Garbage Patch, one of five giant floating concentrations of garbage in the oceans, is the size of Texas? It is also estimated that there are 18,000 pieces of debris in every square kilometer of ocean that are impacting 276 species worldwide. 77 marine animal species in Australia alone are adversely affected, 20 of which are already listed as endangered. The good news is that there are individuals and organisations out there contributing to the reduction of marine debris and creating solutions for our future. The Australian Marine Debris Initiative (AMDI), coordinated by Tangaroa Blue, is a network of communities, schools, industries, government agencies and individuals around the country focused on reducing the amount of marine debris washing into our oceans by monitoring the impacts of marine debris along their stretch of coastline. 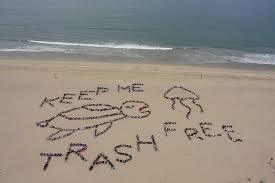 On average 75% of the debris collected during beach clean-ups is plastic. In some areas it is as high as 94%. Plastics are considered the biggest problem as the plastic doesn’t biodegrade but instead breaks apart when exposed to heat or light, making trillions of smaller bits of plastic. Since the AMDI program started in 2004, more than 1.2 million pieces of marine debris have been removed from the Australian coastline and data on this debris has been collated and entered into the Australian Marine Debris Database. In Queensland alone, 186 clean up events occurred last year collecting 218,689 items. This is double the amount of items collected during the previous year. Creating Local Source Reduction Plans is one way the AMDI volunteers can work on practical ways of stopping marine debris at the source using the data they collect on their clean-ups. What is the debris and where does it come from? How do we stop it from happening again? It is a simple concept and proving to be very effective! CAFNEC’s Think Outside the Bag project fits in nicely with the work of AMDI/Tangaroa Blue. We have been working to reduce the use of single use plastic shopping bags and push for a state-wide ban on these bags. This project has taken off in leaps and bounds since the successful launch of the Port Douglas reusable bag. It has garnered tremendous support from the local community and businesses. Politician Michael Trout MP has come on board with the project and has pledged his support for a state-wide ban on single use plastic shopping bags. Another organisation taking a stand for the reduction in marine debris is GhostNet Australia, an alliance of over 22 Indigenous communities from coastal northern Australia, Queensland, Northern Territory and Western Australia. Ghost nets are fishing nets that have been abandoned at sea, lost accidentally, or deliberately discarded. They are particularly destructive to the marine life in the Gulf of Carpentaria where the nets tend to accumulate. Since its inception in 2004, the programme has supported Indigenous Rangers to remove over 7,500 ghost nets of varying sizes. This has resulted in the recovery of trapped wildlife, particularly marine turtles (52%), and the prevention of the ghost nets from returning to the sea to continue their destructive life-cycle. There is much work to be done, but with organisations such as Tangaroa Blue, GhostNet Australia, CAFNEC and many more; we know that there is ‘A Cleaner Future’ ahead!